It’s not iPhone 4 bad, is it? As I confirmed in my recent post, it is indeed possible (and I would now say highly recommended!) to install ESXi onto an Intel NUC DC3217IYE. This article will confirm the process for achieving this. The method I used is one of many possible, but that which I found to be the simplest, based on the tools I had to hand. It’s also worth mentioning at this point that most ESXi features are supported on the platform, including FT. The key features not supported are VMDirectPath I/O, and DPM (due to the lack of iLO / IPMI). They do support WoL so you can manually bring nodes online as required, using any standard WoL tool. I am currently investigating possible options for additional NICs, and it seems that most of the Mini-PCIe NICs are based on a Realtek chipset which is fully supported in ESXi, so happy days! I will post further updates on this subject should I go ahead and expand the NUCs with extra ports. A USB Stick. This should work on anything over 1-2GB but personally am using 8GB PNY Micro Sleek Attache Pendrives as they’re tiny, so less likely to catch on anything as they stick out the back of the NUC box, and they cost less than £5 each. A copy of VMware Workstation 8 or newer. Install the RAM into your NUC (I maxed mine out with 2x8GB sticks). Create a customised ISO with the additional Intel driver. Install ESXi to your USB stick using VMware Workstation and the customised ISO. 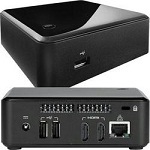 Plug in your NUC, insert the USB stick, boot and go! I wont go into the detail of installing the RAM, suffice to say you unscrew the four screws on the base of the unit, carefully take it apart, install the two SODIMM modules, ensuring they click firmly into place, then screw the unit back together… simples! Run the ESXi-Customizer-v2.7.1.exe (latest version at time of writing). This will extract the customer to the directory of your choosing. Navigate to the new directory. Ensure you tick the Create (U)EFI-bootable ISO checkbox. This will output a new custom ESXi installer ISO called ESXi-5.x-Custom.iso or similar, in the path defined above. Part Two – Install bootable ESXi to the USB stick. I stress that this is my preferred way of doing this as an alternative is simply to burn your customised ISO to a CD/DVD and boot using a USB DVD-ROM. That would however be a whole lot slower, and waste a blank CD! Plug your chosen USB stick into your PC. Open VMware Workstation (8 or above), VMware Fusion, or whatever you use, ideally supporting the Virtualize Intel VT-x/EPT or AMD-V/RVI option (allowing you to nest 64-bit VMs). Create a new VM, you can use any spec you like really, as ESXi always checks on boot, but I created one with the same specs as my intended host, i.e. 16GB RAM, single socket, 2vCPU cores. This does not require a virtual hard disk. Once the VM is created, and before you boot it, edit the CPU settings and tick the Virtualize Intel VT-x/EPT or AMD-V/RVI checkbox. This will reduce errors when installing ESXi (which checks to ensure it can virtualise 64-bit operating systems). Set the CD/DVD (IDE) configuration to Use ISO image file, and point this to the customised ISO created earlier. Once the above settings have been configured, power on the VM. As soon as the VM is powered on, in the bottom right of the screen, right click on the flash disk icon, and click Connect (Disconnect from Host). This will mount the USB stick inside the VM, and allow you to do a standard ESXi installation onto the stick. At the end of the installation, disconnect the stick, un-mount and unplug it. Part Three – Boot and go! This is the easy bit, assuming you don’t have any of the HDMI issues I mentioned in the previous post! Plug your newly installed USB stick into the back of the NUC. Don’t forget to plug in a network cable (duh!) and keyboard for the initial configuration. If you wish to modify any bios settings (optional), you will also need a mouse as the NUC runs Visual BIOS. That pretty much covers it. If anyone has any questions on the process, please don’t hesitate to ask! Silent or as quiet as possible (the lab machines will sit behind the TV in our living room where my current whitebox server sits almost silently but glaringly large!). A minimum of 16GB RAM per node (preferably 32GB if possible). A ‘reasonable’ amount of CPU grunt, enough to run 5–10 VMs per host. Smallest form factor I can find to meet requirements 1–4. Optional: Remote access such as IPMI or iLO. I have previously invested in an HP N36L, which while great for the price (especially when the £100 cashback offer was still on) is a bit noisy, even with a quiet fan mod. Its actually also fairly big when you start looking at buying multiples and stacking them behind the telly! Even so I was still sorely tempted by the new N54L MicroServers which are just out (AMD Dual Core 2.2GHz) and max 16GB RAM) and are within my budget. Similarly I looked into all the Mini-ITX and Micro-ATX boards available, where the Intel desktop / small servers ones seemed to be best (DBS1200KP / DQ77MK / DQ67EP are all very capable boards). Combined with an admittedly slightly expensive Intel Xeon E3-1230 V2, these would all make brilliant white box home labs, but for me they are still limited by either their size or cost. In late November, Intel announced they were releasing a range of bare bones mini-PCs called “Next Unit of Computing”. The early range of these 10cm square chassis contain an Intel Core i3 i3-3217U CPU (“Ivy Bridge” 22 nm, as found in numerous current ultrabooks), two SODIMM slots for up to 16GB RAM, and 2 mini-PCIe slots. It’s roughly the same spec and price as an HP MicroServer, but in a virtually silent case approximately the same size as a large coffee cup! Even better, when you compare the CPU to the latest HP N54L, it achieves a benchmark score of 2272 on cpubenchmark.net, compared to the AMD Turion II Neo N54L Dual-Core at only 1349, putting it in a different class altogether in terms of raw grunt. Not only that, but with the cashback offer from HP now over, it’s about the same price or less than a MicroServer, just £230 inc VAT per unit! On top of the above, there is an added bonus in the extremely low power consumption of just 6-11 watts at idle, rising to ~35 watts under high load. Comparing this to the HP MicroServer, which idles at around the 35 watt mark, spiking to over 100 watts, the NUC shows a marked improvement to your “green” credentials. If you are running a two node cluster, you could conservatively save well over £30 per year from your electricity bill using NUCs instead of MicroServers. Add to that a 3-year Intel warranty and I was pretty much sold from the start! This all sounded too good to be true, and in all bar one respect it is actually perfect. The only real drawback is that the Intel 1gbps NIC (82579V) is not in the standard driver list currently supported by ESXi. This was a slight cause for concern as some people had tried and failed to get it to work with ESXi and held me off purchasing until this week when I spotted this blog post by “Stu” who confirmed it worked fine after injecting the appropriate driver to the ESXi install iso. Total cost: ~£299 inc vat… bargain! IMPORTANT: You will also need a laptop / clover leaf style kettle cable (C5) or your country’s equivalent. In the box you get the power block, but not the 3 pin cable. These can be picked up on ebay for next to nothing. With very little time or effort I was able to create a new ESXi installer with the correct e1000 drivers, boot the machine and I am now happily running ESXi on my first node. I should add that as part of the install I discovered a bug which Intel are looking to resolve with a firmware fix soon. This was the fact that I was unable to press F2 to get into the bios (it just rebooted each time I pressed it). Another symptom of this same bug was ESXi getting most of the way through boot and coming up with an error saying “multiboot could not setup the video subsystem”. This is not a VMware fault. I resolved this by simply plugging the HDMI cable into a different port on my TV (ridiculous!). You might also try a different HDMI cable. Either way it was not serious enough to stop me ordering a second one the same night I got it running! In Part 2 of this article, I will expand on the process for installing ESXi to the NUC, and my experiences with clustering two of them (second unit arrived in the post today so will be built and tested this weekend). I used to be fortunate enough to work from home 80% of the time, which meant that it was relatively easy to keep up with all the different streams, feeds, etc by simply having a second machine and screen up and running when in the house. Since starting a new role as a Solution Architect, I am lucky to be at home one day every few weeks, so I have been forced to rethink my strategy. I have always been a bit of a fandroid, however after starting the new role, I was presented with a shiny new iPhone! After I got back from gagging in the loo, I had to think about how to integrate the Apple app ecosystem into my current Android (tablet and phone) setup, so the number one requirement moving forward was that apps should be able to communicate, access and share information outside of their walled gardens! My old method for keeping up with blogs was to simply add them into Outlook’s built-in RSS reader. This was brilliant as you can then assign Outlook rules to feeds, to remove any junk articles, or move articles you wish to highlight into other directories – a superb feature! Unfortunately this doesn’t have any feasible remote access / sync options (other than RDP which I already use if I am online) so I decided to move all my feeds up to Google Reader to track instead. The migration was really simple as I just exported all my feeds (over 50 of them!) from Outlook as an OPML file, which I was then able to import into Google Reader. Much quicker than having to add each manually! The only thing you lose at this stage is their folder structure, but you can then go to Options\Subscriptions and add the blogs into a single layer of subdirectories. I choose to separate mine by subject, e.g. Virtualisation / Networking / Storage / Tech News / Training etc. To get rid of any articles you are / aren’t interested in, you need the ability to mark them as read / unread in your Google feed. After testing a few different apps, the best I found (for now) is called FeedDemon Pro (currently version 4.1). The free version is a a simple RSS reader with tagging, podcast sync, etc but the pro version (paid for) allows you to filter articles as either “mark as read if…” or “mark as read unless…”. The biggest bugbear with this app is that you can only do a positive or a negative filter on each feed, but not both. I would love to see this ability added in future versions, for example I follow the HotUKDeals feed, where I like to keep any post with tags like “SSD”,”Kindle” etc, but I want to remove any posts with the word “Win”, “Competition” etc. This was possible with Outlook, but not FeedDemon, which is a shame. Once the feeds have been filtered, I needed a way to access them on each of my devices. For that I use the following apps (which each mark items read / unread in the feed so they all stay in sync, irrespective of vendor and device!). Not the prettiest interface, but a great app which works on my phone and tablet, and provides all the usual sharing options, plus the ability to offline cache whole articles should you wish to do so. It also has generated voice options so you can listen to blogs if you so wish (e.g. in the car). I really like the nice clean interface, and the huge array of sharing / integration options. For me, this is the app to beat when it comes to mobile RSS reading. If it came to Android I would be first in line to purchase! Many of the above applications will support auto podcast downloading, but to keep things simple and seperate out this high storage requirement (average podcast is 30–100mb in size), I prefer to have a dedicated app. My preference is to listen to podcasts in the car as it passes the time a little quicker on my 35–45 minute journey to and from work, and you can generally listen to a podcast a day that way. My preferred app (which I use solely on my Android) is BeyondPod. This app has been designed brilliantly and integrates perfectly with my car’s audio system via bluetooth, auto playing the current podcast playlist as soon as bluetooth connects, pausing for phone calls, and saving my place when i turn off the ignition ready to continue where it left off on my next journey! In addition it will auto connect my phone to my wireless network overnight and download the latest podcast episodes I have subscribed to, ready to play at my convenience. I came across this great little video series the other day by elithecomputerguy and though it was well worth a share. We are in the process of releasing a superb new IP telephony / unified comms product at work and I found the following videos most useful in augmenting our training. It goes right through the technologies from PSTN, PBX etc, to the latest VoiP systems.